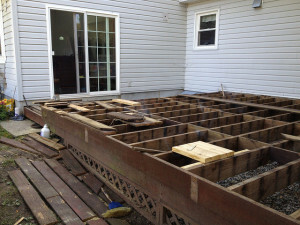 So you want to build a deck, but you just don’t know where to start! Maybe you know what color you want, but don’t know what is going to be in your budget. Maybe you could care less about the color but want to make sure your decking material is tough and will last for years. Or maybe you don’t even know what you want, you just want a little bit of information to give you perspective. There are so many options these days for decking material and each one differs in color, weight, and durability. If you’re not already up to speed on the various decking materials out there, don’t waste your time meandering through Home Depot. You can get the perfect guide right here, right now without ever having to leave your home! Some people have trouble deciding which brand of cereal to buy at the grocery store, let alone choosing the type of deck that will be permanently attached to your house! That’s why Harmony Decking has a list of the most common types of decking material and the pros and cons of each. Pressure-Treated Lumber: This stuff is the #1 seller today. It’s affordable, readily available throughout the country and easy to work with. However, it does have a tendency to crack. Redwood and Cedar: Many people love these types of materials because of the great color. Plus, they look more natural than other types of material. Redwood and cedar can be pricey though, costing three to four times as much as pressure-treated lumber. Tropical Hardwoods: Examples of these hardwoods include Massaranduba, Cumaru and Red Tauari. Many people love the exotic feel, but tropical hardwoods can be super dense and difficult to drill through. Aluminum: Aluminum isn’t very common for decking material but it’s got some great benefits. Aluminum doesn’t crack or warp, plus it’s mold-proof, fire-proof and recyclable! But something that perfect doesn’t come without a price…and for aluminum it’s a high one! It’s one of the most expensive decking materials out there. Contact Harmony Decking Today And Build Your Perfect Deck! It’s never too late to consider adding a deck to your home! A deck can increase outdoor space and can up the value of your home…so why say no? If you have any questions about decking material or you want to start planning your dream outdoor space, you can call Harmony Decking at 215-290-7727. You can even request a quote by filling out our contact form! So give us a call and get decking! It may be a little early for Christmas music, but before you know it the temperatures will drop and snow will be falling! As exciting as this time of year can be, it definitely leaves homeowners with a fair share of work to do to keep their homes safe and clean all winter long. For those of us with well-used decks, part of our job when winter comes is to take care of our patio furniture. But does that mean hiding it inside completely? Or is it strong enough to brave the weather on its own? In this blog, Harmony Decking will tell you about the different types of patio furniture and help you figure out which is best for your deck and lifestyle. Wicker: Leaving furniture made with wicker material outside during the winter is no good. Wicker can expand and contract with the snow, which can cause it to break. Steel: Steel-framed furniture is another type that just won’t be able to handle the cold weather. Too much water and ice can cause it to rust or crack. Take it inside before it gets too damaged and touch up any scratches so it looks fresh for the spring. Aluminum: This is the good stuff when it comes to weather durability! Furniture made with aluminum is the toughest of all patio furniture. Aluminum furniture can be left out all year round. So whether you’re too busy or just too darn lazy to bring it in, buy yourself aluminum table and chairs! Natural Stone: Natural elements oftentimes come with cracks and crevices – which are perfect hiding places for water. Like wicker furniture, water can expand and contract and ruin what was once your favorite outdoor tabletop! Fabric Materials: This one’s probably a no-brainer. Fabric materials should always be brought in for the winter. They’re delicate and weak when it comes to harsh weather and can be damaged easily. If you’re looking to get all decked out and want a patio of your own, contact Harmony Decking today! You can check out pictures of our work on our website. We’re a company started by two friends who value honesty, so with us you’ll always get great work for a fair price! Call Harmony Decking today so we can prove that when you work with us, your project is in good hands. Fall is here and many of us are taking advantage of the precious last few weeks of time out on the deck before the temperatures drop. It’s time to say goodbye to our grills and BBQ parties and get ready to store away our deck furniture in preparation for the winter. Pumpkin picking and leaf raking may be fresh on your mind around this time of year, but for a deck owner, now is actually the perfect time to start thinking about spring! Why now? 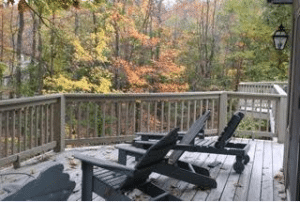 You want to make sure your deck can stay strong during the long winter months. So spend some time this fall getting ahead of the game and prepping your deck for spring. Check the Railings. 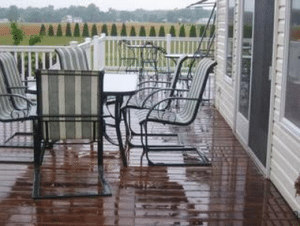 Are your deck railings sturdy or loose? A loose railing can be a nightmare on a cold winter night. Avoid any accidents now and check your deck railings to make sure they’re safe. Is Your Deck Properly Attached to Your House? The best way to keep your deck attached to your home is by bolts. Many decks are attached by nails, which won’t do the trick. So take a peek under your deck to make sure it’s holding on tight. Keep It Clean. The changing leaves are beautiful on the trees, but once they’ve fallen onto your deck they can be a problem. Clearing debris off your deck can help keep it healthy and free of moisture that often gets trapped under piles of leaves. Once it’s clear, give it a quick wash with dish soap, water and a straw brush or broom to keep it clean. Has It Been Stained Lately? A deck’s worst enemies are sun and water. A good stain helps protect it, but only if its done properly and reapplied every so often. A good rule of thumb is to re-stain your deck about once every 3 or 4 years. Let Harmony Decking Help You! If you follow these tips, you’re more likely to have a deck that’ll be healthy and safe all winter long and ready for spring. If you want to learn more about Harmony Decking or have a problem that needs work, you can contact us at 215-290-7727, or email us at harmonydecking@verizon.net. Let us help you with all your deck work this fall! As summer starts to wind down, you may want to bust out your grill one last time while the weather is still warm. Or maybe you want to keep your grill out for the fall, now that football season is upon us. We can all agree that there are few things better (and tastier) than a dinner cooked on the grill. However, if you’re not careful, your burger may not be the only thing touched by flames! Make sure the grill is at least ten feet away from deck railings, siding, and any other combustible items, as well as out from under eaves and away from trees. Get rid of grease or fat buildup when needed. Store starter fluid away from heat sources. Remove charcoal carefully — keep ash containers outside and at a distance from combustibles. Check the propane cylinder hoses for leaks. Don’t light cigarettes or matches near a leaking grill. Check grill hoses for cracks, holes, scratches, or leaks. Move gas hoses far away from hot surfaces and grease. If you follow these safety precautions, you shouldn’t have to worry about your grilling techniques. However, if you’re at all anxious about using the grill on your deck, keep it in the yard. 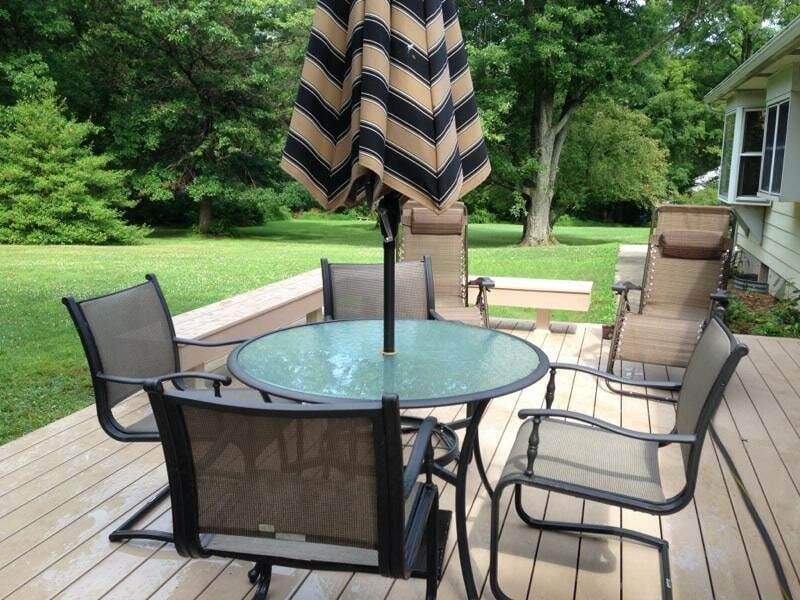 You can still enjoy eating your burgers and hot dogs while lounging on your beautiful deck furniture! Are you in need of a deck repair, renovation, or installation? We have everything you need at Harmony Decking. Our commitment to quality and competitive prices makes us the most reliable decking company in the tri-state area. Check out our work! To learn more, contact us by calling 215-290-7727, or shoot us an email at harmonydecking@verizon.net. We hope to hear from you soon! We know how tricky it is to maintain a clean home and property. If your upkeep isn’t regular, you’re going to have a mess on your hands pretty quickly. The same is true for your deck! Decks can be easily neglected, especially in the wintertime when you’re not using it. As your go-to decking experts, we’re here to give you some tips on how to clean your deck and keep it looking polished! If your deck needs a good cleaning, here’s what you can do. First off, clear the furniture and other outdoor accessories off of your deck. Now it’s time to sweep! After you’ve swept away all the leaves, twigs, and debris, use a commercial deck cleaner to scrub your deck. You can get a deck cleaner at your local hardware store — just make sure it’s suitable for the type of wood you’re working with. If you’re using a toxic cleaner, make sure you wear gloves. You could also make your own nontoxic cleaner with two cups of oxygen-based bleach to a gallon of water. Apply the cleaning solution to the deck, and then scrub your deck either by hand or with a power washer. Rinse your deck with a garden hose, and then let it dry completely before you bring your furniture back out. 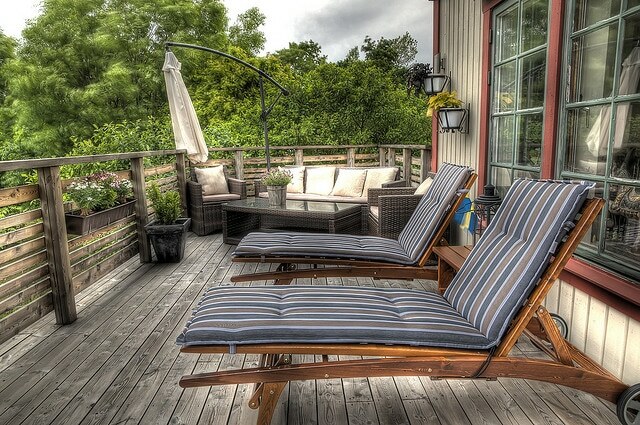 Now that your deck is clean, what can you do to keep it clean and at its peak performance? Make sure you deck is sealed. Sealing your deck will protect it from moisture and sun exposure. Sweep regularly. Blow debris from under and around furniture. Debris like wet leaves can stain wooden decks, and promote mold growth. Clean up messes ASAP. Have paper towels and furniture cleaner within reach, so you can quickly clean up messes (food, spilled drinks, bird droppings, etc.) The quicker you clean up the mess, the easier it will be to get rid of it. Protect your cushions. Store chair cushions in your garage or shed, and only use them when you need them, otherwise they will get stained and dingy with time. Close your umbrella when it’s not being used. If left open, open dirt and bird droppings are more likely to stain it. Consider getting a cover for further protection. Shovel. After a snowfall, be sure to shovel snow off your deck as soon as possible. Tilt your furniture. After a rainstorm, tilt your deck furniture on its side to let the water run off. Getting rid of excess water will allow furniture to dry faster and keep it from getting spotty. Your deck is an important part of your property — treat it as such! For more information about deck maintenance, repair, and renovation, contact Harmony Decking by calling 215-290-7727. Are you wondering if you should replace your deck? Use this checklist to determine if it’s time for a new beginning! 1. Your deck is older than regulations. This is an easy one to keep track of. When was your deck installed? In New Jersey and Pennsylvania, a deck must measure 30’’ above grade level and is required to have guards around the perimeter with balusters of 4’’ or less. If your deck is in violation of the building code, then you’re in need of an update. At Harmony Decking, we can help you with this project, and make sure all of the safety codes are met. 2. Accidents are occurring. If you have loose nails or screws on your deck, you may have had someone cut themselves, rip a piece of clothing, or get a nasty splinter. Protruding fixtures are a definite sign that your deck needs some work done. Don’t wait for an accident to happen — prevent them by replacing or repairing your deck! 3. Stains and blemishes. 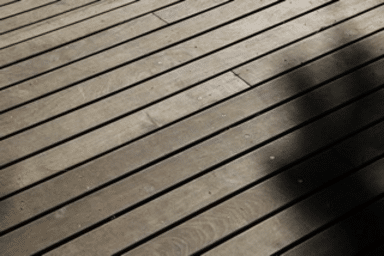 Stains are one of the most common issues people have with wooden decking. Not only do blemishes interfere with the aesthetic beauty of a deck; if they are not properly removed, they could eat through the protective sealant. This can result in peeling, moisture exposure, and rotting. 4. Broken boards. Natural wear and tear and weather conditions can easily damage the wooden boards that make up your deck, which will require some replacement work. Whether it’s small splits in the wood caused by pressure, or completely broken boards altogether, you’re going to want to replace the boards as soon as possible to prevent injuries. 5. Dry rot. Dry rot, due to a moisture source, can cause an alarming amount of structural damage to your decking if left untreated. To check for signs of dry rot, look out for fungal growth, shrinking boards, dark stains, and a musty odor. If you’re noticing any of these danger signs, or your deck is simply falling apart, then it’s high time to replace your deck, or at the very least get some repairs or maintenance. 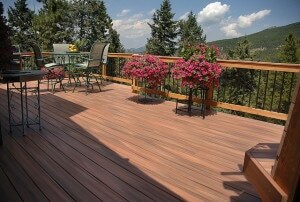 Have a professional decking company come to your house and assess your deck for you and see what needs to be done. The crew at Harmony Decking is ready for your call! You can contact us at 215-290-7727, or email us at harmonydecking@verizon.net to learn more about our decking work! 1. Fits your lifestyle. If you have little ones at your house, you might want some colorful plastic tables, chairs and playsets that can be easily wiped down. However, if you’re more likely to enjoy an evening on the deck with your friends, you may prefer a sophisticated wrought iron table set. Make sure you pick out your deck furniture according to what fits your needs and lifestyle best. 2. Complements your home. Why not bring your home’s interior style out onto your deck? Some things you should consider are the color themes of your home, the siding of the house, and the type of wood on the deck. To ensure that your deck goes nicely with the style of your house, pick out matching furniture and pieces that show off your impeccable taste. Choose floral patterns and wicker pieces for a beachy vibe, and bolder colors and teak furniture for a glamorous touch. The style options are endless! 3. Withstands the elements. You need furniture that will give you as many memories as possible! Pick out furniture made from durable material that will last you a long time instead of bending, cracking, or rusting. Consider the typical weather in your area and plan accordingly. If there is a lot of rain in your area, save your wooden pieces by removing them from the rain, covering them with a protective tarp, or spraying them with a waterproofing solution to keep them looking fresh and new. 4. Keeps you comfortable. Wind down after a busy day by kicking your feet up and relaxing on a lounge chair. Your deck is not complete until you get some comfortable furniture that you can take a cat nap on. Take time to select pieces that invite your guests to slow down and enjoy the simple pleasures of summer. Call Harmony Decking For A Beautiful, Brand-New Deck! Contact us for more information and tips on how to create the dream deck you deserve. Email your inquiries to Harmonydecking@verizon.net or give us a call at 215-290-7727 to learn more about the work we do and the products we offer! 1. Furnish with style. Choose your outdoor furniture wisely. You can choose furnishings made of hardy woods, steel, recycled plastics, or aluminum, depending on your preference. Don’t skimp on the quality. You want to be confident that your furniture will last for years to come, and stand up to sun exposure, wind, and rain. 2. Add details. Rugs and pillows add extra style and comfort, creating a warmer, cozier atmosphere on your deck. Include colorful accents and creativity, either with your furniture or additional decor, such as lights, bird feeders, or hanging plants. 3. Block the sun. Keep yourself cool and safe from sunburn by adding a canopy or an awning, or even a DIY shade alternative. It can also protect your furniture from the elements and from fading, and makes it possible for you to sit outside even when it’s raining. 4. Make it safe. 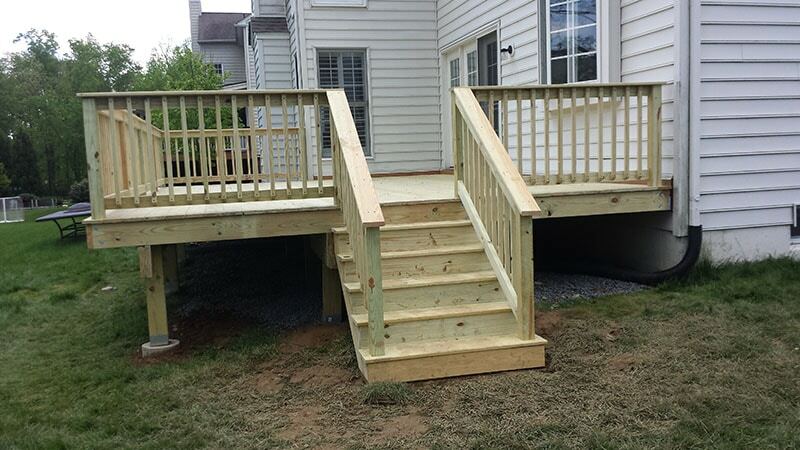 Keep your deck accessible to those who may be prone to accidents. Install lights for a safe pathway to your deck, and include a gate or railing for added safety. 5. Wire for sound. Enhance your outdoor parties by installing a weatherproof outdoor sound system. Speakers can be hung up discreetly and out of the way, so you can enjoy your favorite music without any concerns. 6. Clean and stain your deck. It’s time to fix up those grimy boards. Make sure you clean and restain your deck so it can look its best and withstand the elements. If you need help staining your deck, renovating your deck, or installing a brand-new deck of your own, choose Harmony Decking! We’ll give your deck a transformative makeover. We offer only the highest-quality products and materials for our decking and railing projects, and we have the expertise and passion to create your dream deck at an affordable price. The proof is in the pictures and testimonials! Contact Harmony Decking at 215-290-7727. We’ll discuss your plans for a beautifully designed deck that will surely impress! At Harmony Decking, we offer our clients a wealth of choices when it comes to installing or replacing a deck, including the type of material we use. Last time we told you about the benefits of pressure–treated wood, and now we’re going to give you some information about TimberTech decking material, another wonderful option for a beautiful, expertly crafted deck. 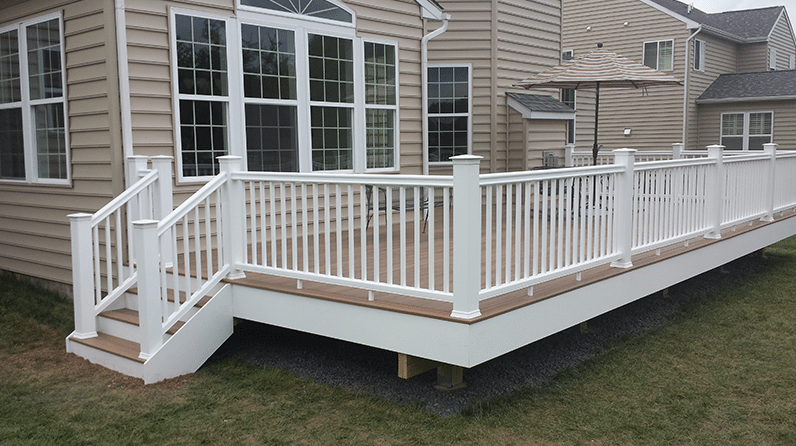 TimberTech is a decking, railing, and fencing manufacturer located in Wilmington, Ohio. The company began in 1996, a year after the Crane Group, TimberTech’s parent company, invested in a new blending system that combined wood and plastic. TimberTech is known for its wood plastic composite and low-maintenance polyvinyl chloride (PVC) planks. Manufactures their products with an average of 51% recycled content. Ensures that all of their products are urea formaldehyde-free. Uses 107 million pounds of post-industrial flour and post-consumer plastic annually. Stronger and denser than regular wood. Hassle-free; no need to paint, sand, or stain the material. PVC planks are another unique option because they do not contain any wood. It is an excellent choice if you’re looking for decking that is fade and stain resistant, lower maintenance, and environmentally friendly, since PVC planks are created from recyclable products as well. Our TimberTech materials are durable and high quality, and come in a wide variety of colors. Composite decking promises a long life-span. There will be no need to replace rotting boards with new ones, which means big savings in time and money in the future. TimberTech decking material also increases the value of your home! The benefits are truly incredible. For more information about our TimberTech decking or other decking materials, contact us at 215-290-7727. We are deck specialists with the knowledge, skills, and passion to transform your deck into a work of art. Just click here to see examples of our assignments! We offer the finest decking projects in the area, so tell us about your vision and we’ll get straight to work. Welcome to Harmony Decking’s first blog post! We thought it was about time we start sharing our tips, facts, and tools of the trade with the public! For our first post, we’d like to give you some information about the benefits of pressure-treated wood. 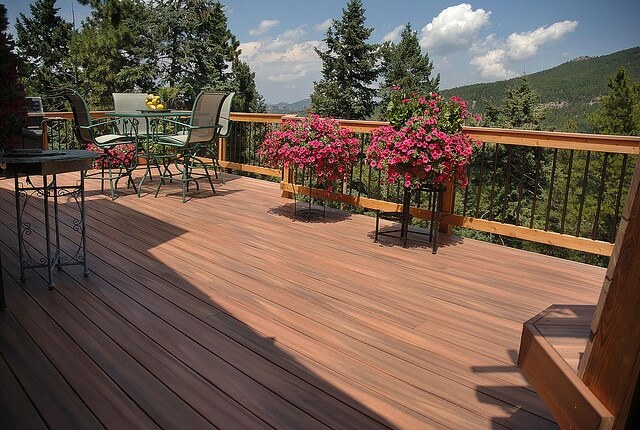 At Harmony Decking, we specialize in pressure-treated wood for durable, weather-resistant decks. 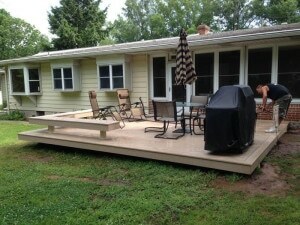 If you’re thinking about installing or renovating a deck, this could be a great option for you. Pressure treating is the process of adding chemicals to the wood to protect it from insects, microorganisms, decay, and the elements. It’s a commonly used type of building material in the industry. Why is a great option for your deck? It’s cost-effective. The price of the initial installation is low, and it is also low-maintenance, making pressure treated decking a popular choice for those looking for a bargain. If you’re going to be involved in a big building project, this can be a substantial source of your savings. It’s tough. Pressure-treated wood is one of the strongest types of decking material, especially once it has been sealed. It is able to hold up to a lot of wear and tear, and it’s less likely to get dented or scratched. Pressure treating can protect the wood for over 20 years, making it an excellent choice for outdoor projects. It repels insects. Pressure-treated wood is actually toxic if an insect spends too much time on it, or bites into it. This will keep your deck looking fresh, and it will make your summer nights a little less buggy. It looks good. Pressure-treated wood gives off a natural appearance, which most people prefer. However, it is possible to add some color as well, since pressure-treated wood can be painted or stained very easily. If there’s a scratch or a blemish, it can be sanded off quickly and easily. As you can see, pressure-treated wood can yield wonderful benefits! If longevity and economy are what you’re looking for, a pressure-treated deck built by our Main Line deck company is a wise choice. If you’re interested in installing a pressure-treated deck, contact us today! We also offer Timbertech, Trex transcend, and Wolf-designed decks, to suit every style and need. Give us a call, and get the deck you’ve been dreaming about! And follow our blog for more tips and information about our work.